Severe winter chill and summer heat coupled with extreme humidity are challenges that gardeners face in the Midwest. Many Salvias are excellent choices as long-blooming annuals in the region while others -- ones that can withstand cold winters -- are reliable perennials. 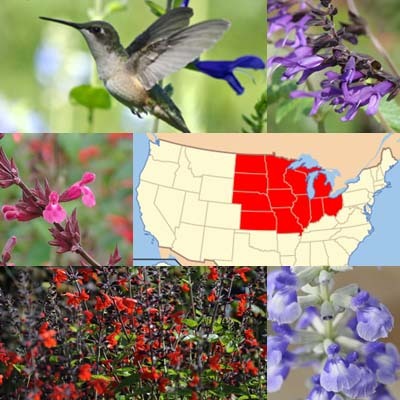 However, before considering Salvias for Midwest gardens, it helps to explore the region's boundaries. Even federal agencies vary in how they draw these lines. The U.S. Census Bureau divides the nation into four regions. It identifies the Midwest as containing 12 states: Illinois, Indiana, Iowa, Kansas, Michigan, Minnesota, Missouri, Nebraska, North Dakota, Ohio, South Dakota and Wisconsin. In contrast, the Environmental Protection Agency excludes Kansas, Nebraska and the Dakotas from its Midwest map based on climate. Farmers in the Corn Belt areas of the Dakotas might disagree. In another map based on climate, the National Oceanic and Atmospheric Administration adds eastern slivers of the Dakotas as well as eastern portions of Nebraska, Kansas and Oklahoma to the EPA picture. In addition, NOAA includes Kentucky, northern ribbons of Arkansas and Tennessee, western chunks of Virginia and West Virginia and a long, rectangular smidgeon of western Pennsylvania. At Flowers by the Sea, we aren't demographers, geographers or climatologists. We can't tell you exactly where the Midwest begins and ends. So if you find us wandering over what you consider to be the boundaries, please allow us to color outside your lines. If you begin at North Dakota and travel south to northern Virginia and West Virginia, the USDA Plant Hardiness Zones range from 3 (average annual winter low of -40 degrees F) to 7 (0 degrees F). Hardiness zones only concern winter chill. For a complete explanation of the role they play in plant selection, please read Getting Started: USDA Plant Hardiness Zones. In areas with extremely cold winters, such as zones 3 and 4, most Salvias are grown as long-blooming annuals and are top choices of wildlife gardeners. Some adventurous Salvia gardeners in the far north like to experiment with mulching techniques for overwintering favorite plants. For more information, please read our Quick Digs series on winter garden preparation, which includes Putting Salvias to Bed with Winter Mulch. If you want to attract hummingbirds, you'll find many suggestions about what Salvias to grow as annuals in the upper Midwest in our article Portraits in Gardening: Michael and Kathi Rock's Hummingbird Journey. Friendship Sage (S. 'Amistad'), Tropical Sage (S. coccinea), Scarlet Sage (S. splendens) and Mulberry Jam Roseleaf Sage (S. x 'Mulberry Jam') are some of their suggestions. Further south, large parts of Illinois, Indiana, Missouri and Ohio are in the relative winter warmth of zones 6 and 7. The Missouri Botanical Garden (MOBOT) recommends a long list of Salvias as annuals in these zones. These include Anise-Scented Sages (S. guaranitica spp. ), Mealy Cup Sages (S. farinacea spp.) and Pineapple Sage (S. elegans). MOBOT also categorizes Prairie Sage (S. azurea), Mountain Culinary Sage (S. officinalis 'Berggarten') and the Japanese groundcover Shinano-akigiri (S. koyamae) as perennials withstanding Zone 5 winters of the region. Toward the heart of Kansas in the small town of Hesston, the Dyck Arboretum includes the Zone 6 Furman's Red Autumn Sage (S. greggii 'Furman's Red') and Zone 5 Ultra Violet Hybrid Sage (S. lycioides x greggii 'Ultra Violet' ) in its collection. Botanic gardens are often places where plant trends take root. Dyck Arboretum focuses on cultivating plants native to America that foster insect pollination. Autumn Sage, in all its many varieties, meets that description. Continue on to the western edge of the Census Bureau's Midwest boundaries -- where Kansas meets the semi-arid plains of Colorado -- and you find a large, drier swath of Zone 6 ideal for heat- and drought-tolerant Autumn Sages. But when it comes to cold winters, Meadow Sages from Europe and Central Asia are among the most reliable perennials in the Salvia genus. Some, such as Salvia haematodes, are known to survive Zone 3 winters, but it's difficult to guarantee their success during long periods of extreme cold. At Lurie Garden in Chicago's Millennial Park (Zone 6), a "river" of blue and purple Meadow Sage blooms from June through early July. Lurie, which opened in 2004 and covers five acres, is one of the largest rooftop gardens in the world and covers an underground parking structure. The Salvia River, designed by naturalistic landscape artist Piet Oudolf, is a tourist attraction during bloom time. Whether you live way north, south, west or east in the somewhat amorphous boundaries of the Midwest, FBTS can help you find sages and companion plants that are right for your garden. If you live in Iowa and decide to clear some corn to plant a river of Meadow Sage, we're sure they will come (they being curious onlookers and many a pollinator). Please call or email us. We'll listen to your dreams, then go with the flow and help you stream them live.